When it comes to trailer security, there are so many people that do not use a trailer hitch lock. This basically means anyone can walk over to your trailer and then hitch it onto the back of their vehicle and make their getaway with your expensive asset. The best trailer hitch lock is the Proven Industries 2516, which is completely bolt cutter proof with an all steel construction that covers the hitch. When it comes to compatibility, you can purchase a trailer hitch in a variety of different sizes or shapes. Therefore, its crucial that you purchase the correct trailer hitch lock size and many brand offer various different sizes for this exact reason. 7.1 How Easy Is It To Steal A Trailer? When it comes to the different trailer locks, there are cheap and then there are expensive choices. As you can imagine, the majority of cheap trailer tongue locks are going to be easy to break and simply act as a deterrent. Therefore, depending upon how expensive your trailer load is should reflect your buying decision. Considering that the price of common trailer loads such as RVs, jet-skis, car transporters and other assets go into the thousands, its worth spending the extra. 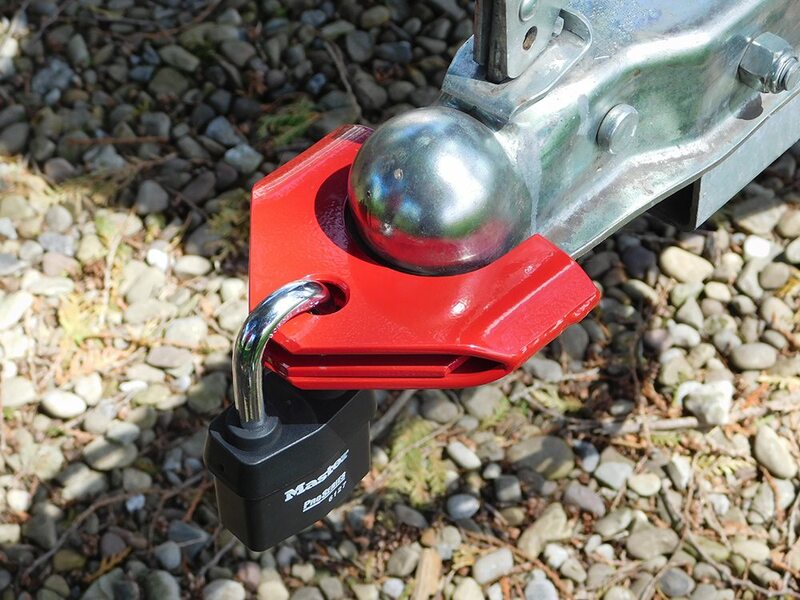 For those that have expensive loads on their trailer, a secure trailer lock should be an essential accessory. Below is a list of the best trailer locks that will fit a range of hitches and protect your trailer load from thieves. If you after the ultimate protection for your trailer and there is no budget as such, Proven Industries have the answer with the 2516 model. Made in the USA, it is bolt cutter proof and is the best trailer lock you can buy. There is no denying that this trailer hitch lock is not expensive because it is. However, you can rest assure that this will protect your trailer from being unhitched by a thief as its the ultimate protection against theft. Overall, it is the best trailer hitch lock that you can buy and will fit most 2 5/16 inch couplers. Tow Ready’s Gorilla Guard is a different design as it sits more on the front of the hitch as opposed to a clamp over the top. The lock itself is very heavy duty and can with stand a thieve hitting it with a hammer all day. Overall, it is the best trailer hitch lock for the money and the design effectively stops a range of attacks. The only main drawback is the fact that it lacks compatibility with other coupler sizes. For those that have expensive loads and need a top of the range trailer lock, then the AMPLOCK U-BRP2516 is the best option. Like the Proven Industries hitch lock, this is an expensive choice but considering the prices of most RV’s along with your personal belongings inside, it is a worthwhile investment. Installing this trailer hitch lock is as simple as pushing it on and locking the cylinder. Unlike many of the cheap alternatives, AMPLOCK state that there are millions of key combinations available with each customer receiving a unique code. Overall, it is a high quality trailer lock that will provide you with peace of mind that your trailer is secure. It does come at a cost but if your trailer and the cargo on it are worth thousands, it is a worthwhile investment. Installation is very easy and will fit a range of trailer couplers without any issues. The lock itself is a shackle, meaning picking the lock is much harder compared to cheaper models. Overall, its a good all rounder in terms of security and is very popular across the US. 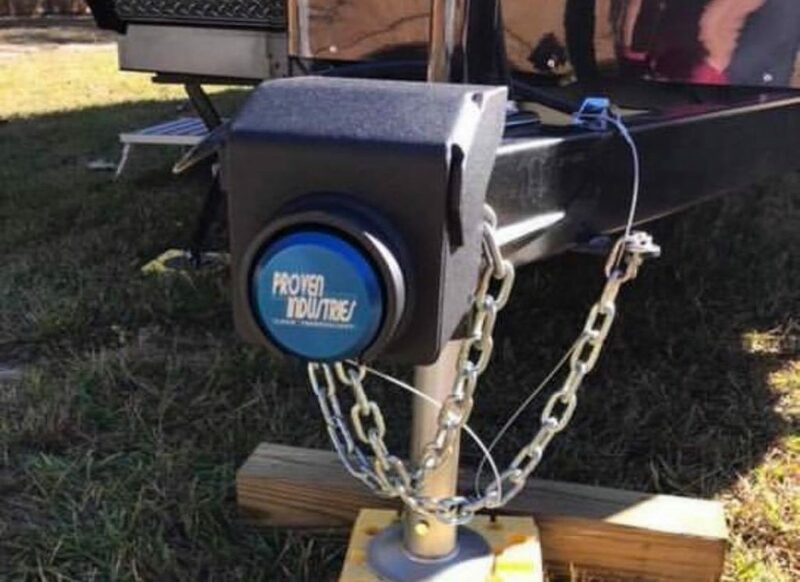 The Reese Towpower tow hitch lock is a more affordable option for those that are looking for trailer security. It is a bright yellow design, which acts as a highly visible protection for those looking for a quick theft. The design of this tow hitch lock is fairly simple and very easy to install with the adjustable loop. The way to release the locking clamp is by simply turning to key clockwise and hold it in that position and pull the clamp upwards. Overall, it is a cheap trailer hitch lock but due to the budget price, it is does mean durability can suffer. As mentioned in the below buying guide, it is possible to hammer the aluminum body to pieces with a hammer. 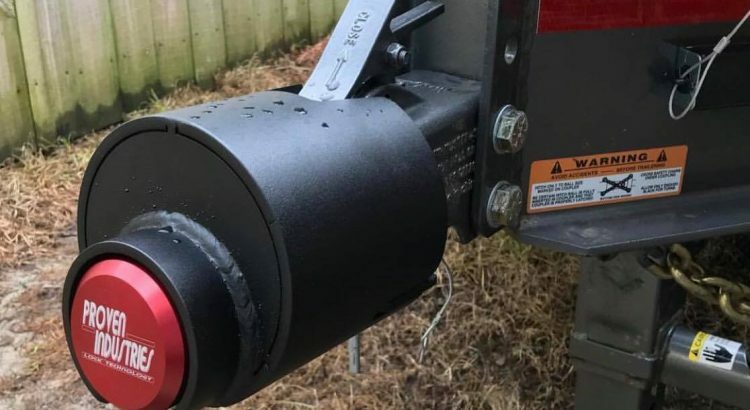 This is a cause for concern but if you have a cheap trailer with a budget lock such as the Reese Towpower, it will act as an excellent deterrent. When it comes to protecting your trailer, its important that you invest wisely into a trailer hitch lock. The trailer and the cargo on the trailer can cost thousands of dollars and without protection, it can all be stolen in a matter of minutes. 90% of the time, a cheap trailer lock will act as a deterrent and put those criminals off. This is because they will be looking for an easy target. However, if your trailer load is expensive but is using a weak lock, then it may be worth the criminals time and effort hammering it off. Therefore, within our recommendations we have mentioned premium alternatives that are virtually impossible to take off without the key. The ease of which you give the thieves is up to you. For example, if you leave your towable possession (lets say a boat on the trailer) on your driveway, with nothing attached to it and its pointing towards the road, you are asking for trouble. If you are towing with your vehicle and you stop for a period of time, a criminal may pounce when you are not looking. 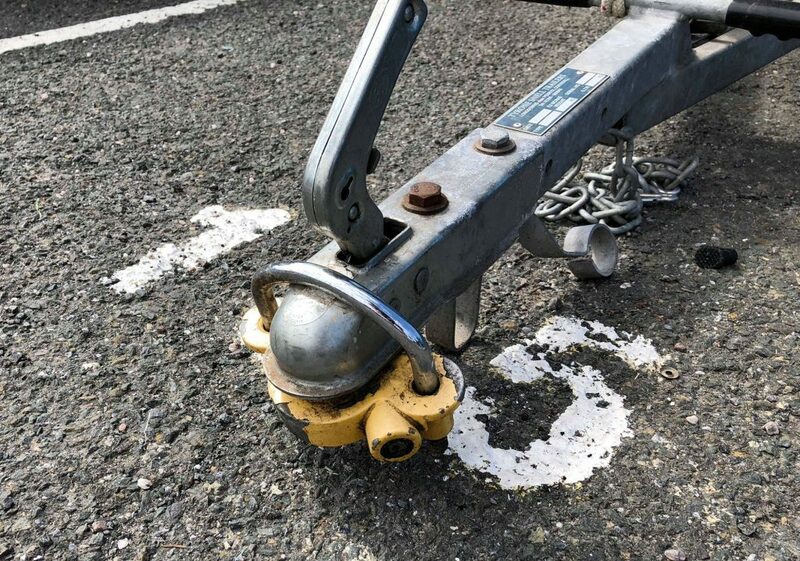 If you have not installed a trailer hitch lock, they can simply pull up, disconnect it from your vehicle and put it on theirs. Even those with a hitch for a fifth wheel trailer, a determined criminal will be able to get past the jaw mechanism and take your trailer with them. The same can be said with a more complicated hitch such as a hitch using a weight distribution system. As you can imagine, the first thing a criminal will try is to use brute force to remove your lock. For example, constantly hitting the trailer lock with a hammer until it falls apart. If the body is made from an aluminum or zinc material, this may eventually fall apart through the heavy impacts. Look out for hardened steel throughout the construction (such as the Proven Industries lock), which will be able to withstand heavy impact damage all day long. When it comes to the popularity and low cost examples, the uniqueness of the keys can become an issue. For example, a criminal may have a selection of keys available to them and it is a matter of trail or error that may result in a match. Brands that mention that they have thousands or millions of key combinations are highly recommended. Ensure you keep the packaging or note down the unique code of your key because you may be in trouble if you ever lose the key. With a trailer hitch lock, you really do get what you pay for. The cheaper alternatives will always be easier to unlock than the more expensive coupler locks. One of the most popular locks in the US (Reese Towpower) has been known to break easily if you hit the aluminum body with a hammer a few times. However, it gets worse as you can watch this video, it demonstrates the effectiveness of the Proven Industries compared to cheap alternatives. With that being said, it still acts as an excellent deterrent to those looking for a trailer that is quick and easy to steal. It remains within our recommendations primarily for that reason alone and it does hold some security values for your trailer whilst also being cheap. Not all trailer hitch locks are universal and some will only fit common hitch sizes. The most common is either 2 or 2 5/16 inch couplers but its crucial that you check the size of your hitch before purchasing. On top of the hitch size, be sure to check that the design of the lock you choose will not get in the way. You will want it to be securely locked in position without having to be adjusted to avoid other objects. Above are just 6 ways to prevent the theft of your trailer. Some owners may also extend their aftermarket car alarm to also protect the trailer. However, the main steps listed will almost certainly make a thief think twice before attempting to steal your trailer. Of course, if a thief has lots of time to steal something, they will be able to remove anything. Some tow hitches have a design flaw where they get a long pinch bar between the lock coupler and tow ball and then use lots of force. However, this will make a lot of noise and take time, which you should be able to hear/see. Using a coupler lock to secure your trailer with potentially an expensive load on is a worthwhile exercise. The coupler lock that you choose is dependent upon your budget but even with the cheapest coupler lock, it is a deterrent to put anyone off stealing your trailer. Most criminals will just want to hitch it up and make their getaway. All of our recommendations will secure your trailer and put off any criminal. If the load on your trailer is expensive, this should reflect the price of hitch lock you purchase.